A Huge Thank You to everyone who participated in the preparation work for our Norse Mythology themed float for the Parade. So well done and thank you to Kaisa, Audrey and the Signal Arts staff and to all of the Community Groups who worked so incredibly hard. We could not have done it without YOU! What a memorable occasion Culture Day/Night 2017 was, here at Signal Arts Centre! A HUGE Thank You to everyone who came along, and to all of the Community Groups and Kids from the Art Class who made the wonderful pieces for display.. Thank You also to Antonella and her Italian Folk Song & Dance Workshop which had everyone on the floor and to the superb Belly Dancers who put on a fabulous show to close proceedings. Lastly, a Big Thank You to the Signal Staff who worked tirelessly planning and preparing in the weeks & months beforehand and who ensured that everyone had a brilliant time on the day itself! After several weeks of preparation and onsite visits by Helen, Margaret and many Signal staff, a really fantastic day was had by the children and staff of the Samuel Beckett Civic Centre who took part in painting a mural this week, which was meticulously designed by our own Helen. While many children were busily working on the mural some of the other kids made worry dolls and did some colouring in a class facilitated by Emma, Audrey, Wren and Miranda. 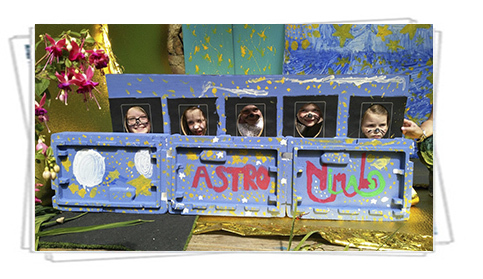 So a huge thank you to all of the children, to all in Ballyogan and to the Signal Staff for such a fabulous final day..
A great fun-filled afternoon was had by the by kids and and parents here at Signal Arts last Friday when they staged their 'Astronimals' Play, which was scripted by Ciaran. The group was facilitated by Margaret (who also had a part in the Play ) and Ciaran. Thank you to all of the children, the Parents and to the Signal Staff for making it such an enjoyable day for all. 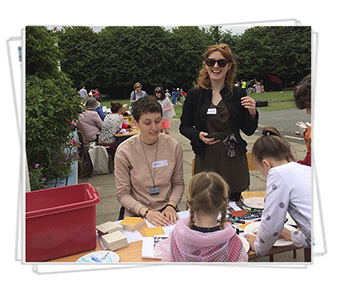 Here are some fabulous photos from the Bray Summer Project - Arts Day on June 29th. Many Signal Staff Artists were on hand to ensure all of the children had a fantastic day. They enjoyed having a go at creating some pottery on the potters wheel and also had great fun painting and decorating ceramics. And they also had the opportunity to make worry dolls and to do some drawing. Thank you to all of the children and to the Signal Staff for making it such an enjoyable day for all. Here are our two classes from Sunbeam enjoying the beautiful sunshine in our Signal garden. The classes are facilitated by Margaret, Helen, Stephanie and Nic. It was a wonderful day and everyone had a fabulous fun-filled afternnon. Here we have some amazing photos of the St Patricks Day Parade so a huge thank you to all the staff in Signal who embraced the challenge. And especially acknowledge the sterling work of Gill, Nic, Helen, Patricia, Margaret, Stephanie, Donal, Ciaran and of course Brian. 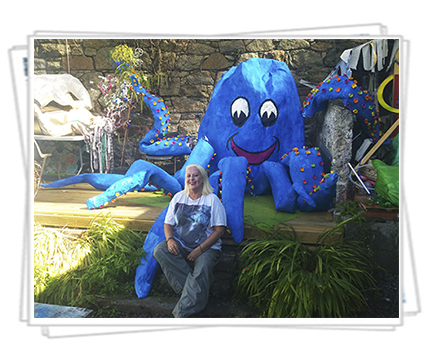 Ger, Mary and Patricia produced amazing Star Fish and Greg the incredible Gerald the seal. The Finding Dory scene on the truck was the mastermind of Gill 'creative genius' Cassidy, with a lot of help from staff. Again James excelled himself with the photos and video and Aidan, as his able assistant. The parade would be nothing without the costumes designed and worn by staff and some of the children from the classes run in Signal so thank you so much for your input. Lots of people walked and got involved on a voluntary basis and that included a parent of one of childrens class, Vincent, who gave us his truck and his time for the parade, so thank you Vincent. AND A HUGE THANK YOU TO ALL OF YOU THAT MADE ST PATRICKS DAY SUCH A MEMORABLE EVENT! 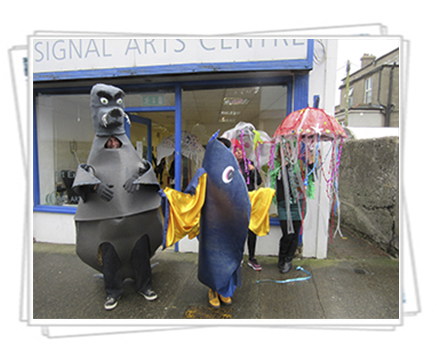 Here are some photos from our Culture Night day on September 16th which had an 'Under The Sea' theme this year. So a special Thank You! to all of the following who contributed pieces: ..Purple House Cancer Support, Rehab Care, Willowville Carmona Services, Sunbeam House, Bray Lakers, Seomra, Little Bray Community Centre, Enniskerry Play School, Signal Kids Art Class, Bray Tidy Towns, Aoife Patterson, Brigid O'Brien, Paul Flynn, David Salmon and Stack's Family Butchers. We could not have done it without your help so a heartfelt Thanks to you all! And thank you to our staff past and present for running the Kids Workshops throughout the afternoon and also thank you to the excellent 'Chaos in Harmony' and 'Tambourine and Roses' who provided the perfect end to the days events with wonderful music and song. To see a fully comprehensive article in our Oct/Dec 2016 Newletter please Click Here! Our 'Summer Camp' held here at Signal during the August bank holiday week was great fun for everyone. 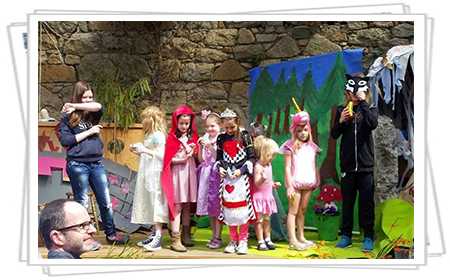 The children created their own fairytale which included 3 Red Riding Hoods, a Unicorn, The Queen of Hearts and Queen Elsa of Arendelle! 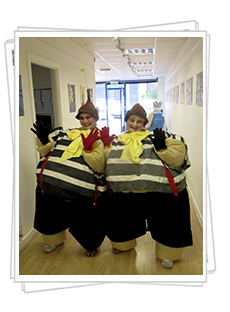 They made their own costumes and paintings and they also had plenty of time for fun on the beach and ice cream breaks! Then they put on a performance of the fairytale for the parents. Our own Silvia and Stephanie facilitated the Camp over 4 days and they also had a fantastic time! 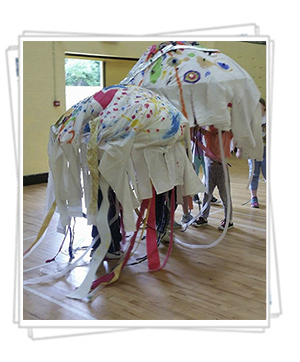 Here are some photos of the wonderful Jellyfish made by local children in a workshop for our upcoming Culture Night on September 16th which has an 'Under The Sea' theme this year. The workshop was facilitated by our own Aoife, Stephanie, Michaela and Hannah. A fabulous fun-filled afternoon was had by all in Little Bray Community Centre on July 12th! 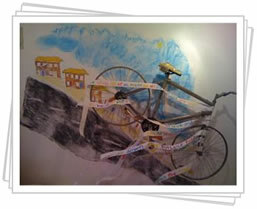 A fantastic Mural created especially for Sunbeam House! 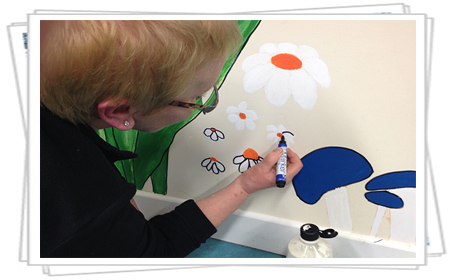 Our own Andrea and Aoife have been working tirelessly on a Garden themed mural for Sunbeam House Services over the last 10 to 12 weeks. And they also had some assistance from Victoria and Aidan. On each visit they addedc more detail and slowly built up layers of wonderful vibrant colours which compliment each other superbly. The mural is now finished! A fun filled day at St Patrick's Bray Parade 2016! An appropriately coloured purple truck supplied by Greenstar arrived at 10.00am sharp; at that stage the staff artists were already working hard at assembling all the artwork that had been created for the float over the previous weeks. Over the following few hours the float began to take shape. Piece by piece the artwork was carefully arranged, tweaked and hoisted into place and Signal Arts Centres interpretation of the magical story of 'Alice in Wonderland' began to unfold. Once they were ready the assortment of characters to include Tweedle Dum and Tweedle Dee, the White Rabbit, the Queen of Hearts, the March Hare, the impressive Queens Armed Guard, the Bumble Bee, the Duchess with the crying baby, the Cheshire Cat, Absolem the Caterpillar, Alice of course, and the Mad Hatter to name but a few of the many fantastic costumes and characters that were represented on the day. Once the parade started we entertained and excited the crowd with jokes and antics surrounding the theme of the Mad Hatters tea party, while Absolem the caterpillar cheered and waved to the crowd from the giant mushroom on the float. The Mad Hatters tea party escalated to a truly hysterical affair at the judging panel as the tea party took full flight with Tweedle Dum and Tweedle Dee running amok, the grinning Cheshire Cat and the Queen of Hearts dancing a merry dance and the March Hare leading ring-a-ring-arosie. Our performance evidently impressed the judges as we scooped the Arts and Entertainment Award much to our delight. We would like to thank all of the Signal staff for all their hard work and commitment, and to all our enthuaisastic volunteers who joined us on the day. 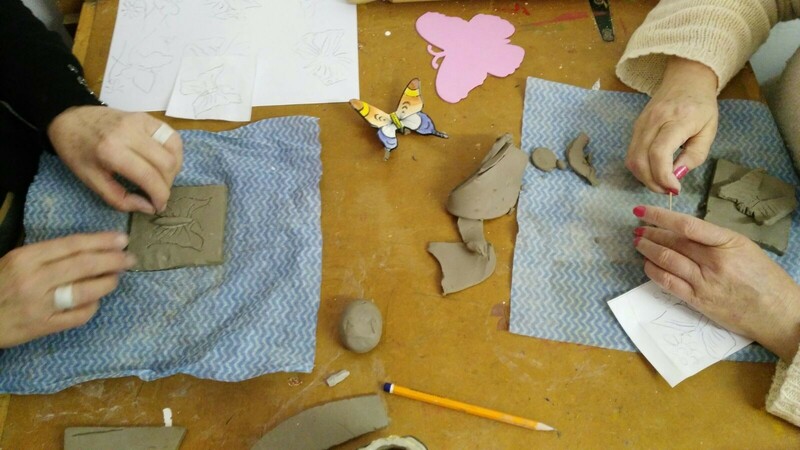 Due to the marvelous success of last year's ceramic classes, all of our students have returned to continue exploring the wonderful world of clay, by creating fantastically unique works of art here at Signal Arts Centre. 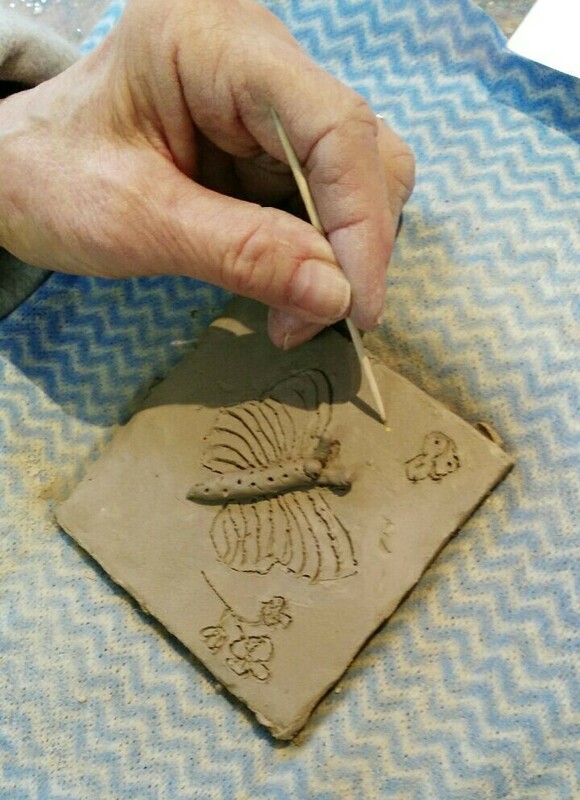 Signal Arts Centre is delighted to be working alongside the Purple House Cancer Support group this year by hosting their weekly ceramic classes. Ger and Trish are happily facilitating these classes and are excited to have the chance to work with the Purple House team again. 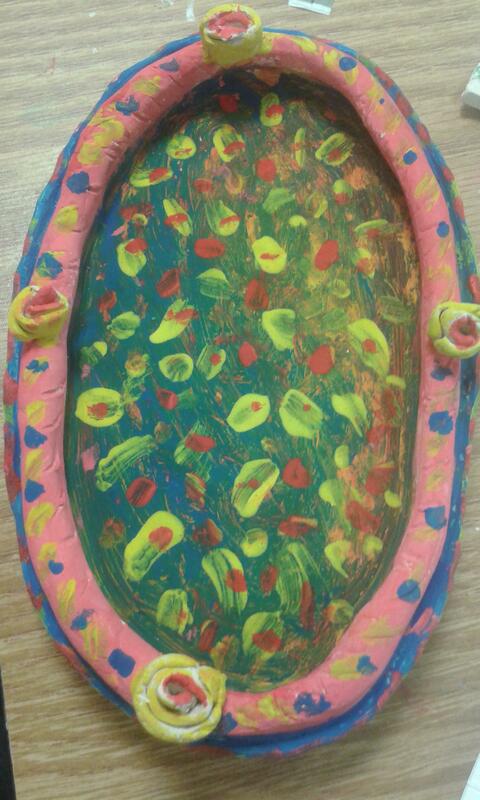 Ger Keenan and Trish Lewis facilitated a Ceramic Class up in Purple House Cancer Support in Bray for the last 6 weeks. There was a small group of students and they were an inspiration to work with.They received the basic lessons in how to prepare clay to remove air bubbles. 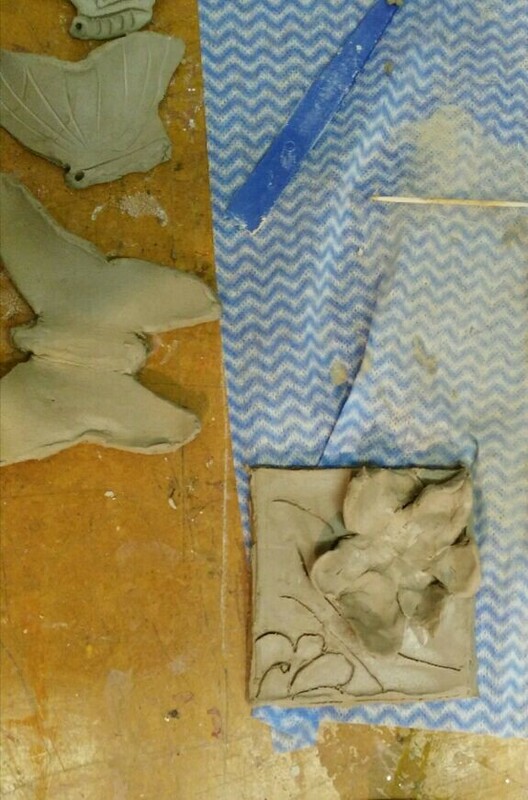 We used air drying clay for the classes. Clay is very therapeutic and healing and it can react to your moods. The pupils started making small pinch pots and candle holders and progressed with us teaching them how to create coil pots and the basics of slab making. The class was buzzing with enthusiasm and each week they churned out individual little creative works of art such as jewellery pieces, jugs, sugar bowls, Christmas decorations and lots of unique ideas. 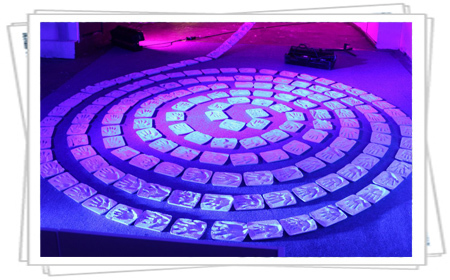 Such was the enthusiasm that we bisque fired the pieces in Signal Arts Centre in our Kiln. 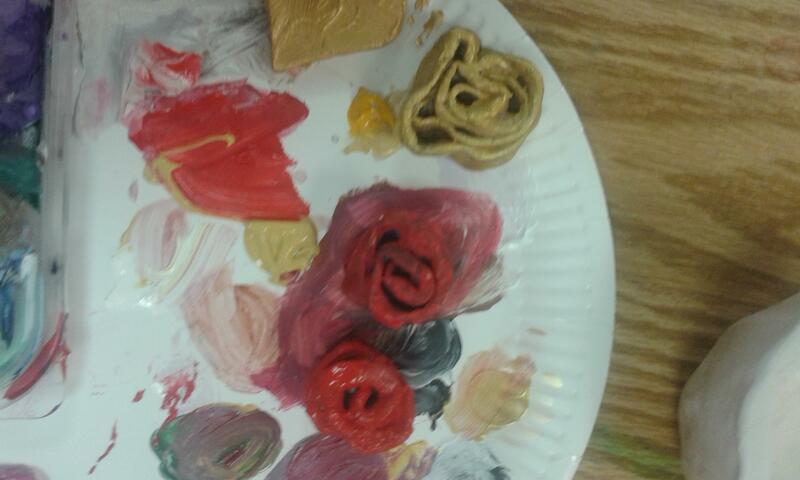 The class then hand painting and varnished the items that they made. Purple House, led by Veronica O'Leary the founder and CEO of Purple House, is the first community based cancer support centre in Ireland. The staff members are exceptional with helpfulness, kindness and loads of smiles. It is indeed a really special place, like the people there. The colour purple symbolizes sensitivity, compassion, understanding, and supporting and thinking of others before themselves. It also inspires others to deal positively with adversity, those were the feelings we encountered about the people in Purple House. We both really enjoyed the experience and fun and imparting our knowledge and we both enjoyed the pupils as well. We are hoping in the future to work creatively on new ventures and more ceramics courses with Purple House. The Kids Art Classes, facilitated by Gill and Patricia, are very popular here at Signal Arts Centre. And it is really great to see the children create fantastic pieces of art and have some real fun while doing it. 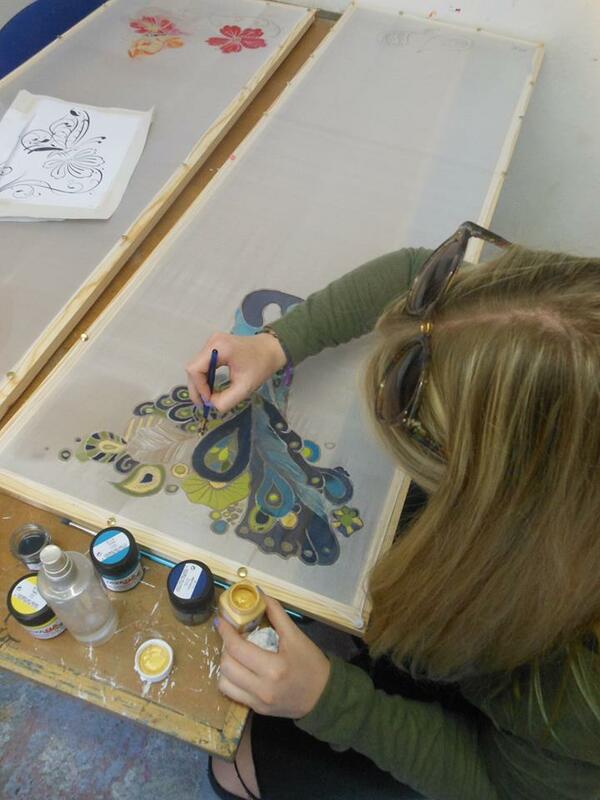 These Classes are ongoing and run for 6 week periods on several occasions throughout the year. Both Silvia and Ger are delighted with the resounding success of the classes and with the wonderful creations made by all of the Class members. A fun filled day at Bray School Project 2015! 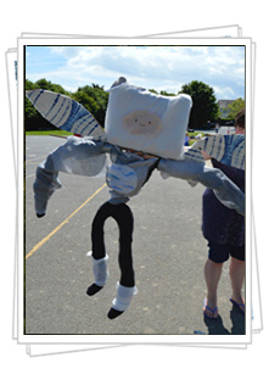 The Signal Art Centre went to The Bray School Project to do a workshop to create scarecrows for Culture Night. The children first drew scarecrows using the exquisite corpse method, and then they created a scarecrow based on their drawings. Different materials were compiled to create unique and colorful scarecrows. Each scarecrow will become part of a collaborative community art project installed in several locations in Bray on the 18th of September 2015 to celebrate ‘Signal Arts Centre’s Culture Night event’. St Patricks Day Parade 2014! 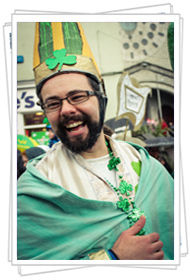 Signal Arts Centre came out on top in this years St Patricks Day Parade in Bray with their "Irish Mythology" theme. Some creative work from stalwarts like Gregg Murray and Signal staff artists like Andrea Paul, Aoife Patterson, Johnathan Curran, Lucy Arnold and Ciara Brehony to name but a few brought together one of the most colourful pieces to the Parade. Someone quoted " I think Signal Arts Centre should be in charge of the Parade every year because of the colour they bring!" Have a look at our images here, you might agree... And you can also check out our video of the successful day here. 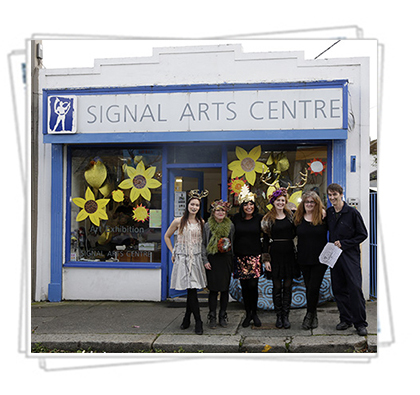 Another fine example of Signal Arts Centre reaching out into the community was at the children's creche in Old Court, Bray over Christmas and early 2014. Jenny, June and Sylvia created some fantastic muralled art work within the creche. This really brightened up the facility and the kids think it's fantastic. Signal Arts Centre, the Art Beat Of Bray. Culture Night 2013 was by all accounts Signals most ambitious project to date. Led by Noel Cleary and Pat Burnes this event "Open Doors" signalled the Art Centre's policy of being open to artist of all descriptions and also open to the community. Here is a selection of colourful images from the day displaying doors artistically given a new lease of life by schools, groups and artists. The Award Winning Signal Artists in the Bray Parade! 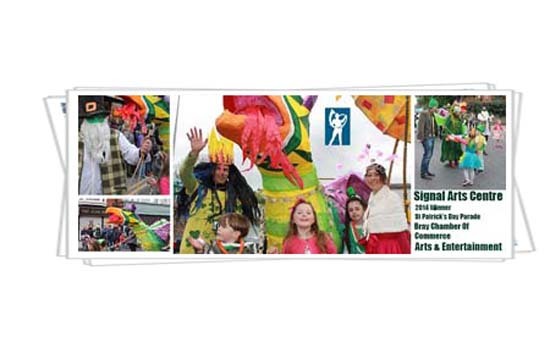 Signal Arts Centre once again got involved with the St Patrick's Day Bray Parade. The Centre added some great colour on a wet and cold St Patrick's Day and our efforts did not go unnoticed as we will now recieve an award for our contribution to the festival from the Chamber of Commerce in the Town Hall. A lot of work is required to get ready for the St. Patrick's Day Parade. Here a selection of Signals Finest do a lot of prep work prior to the big day. A great team effort that brought all their artistic skill and imagination together! Another brilliant colourful event from Signal Arts Centre. Greg Murray, Signal Artist teamed up with some students from St Peters School for a summer camp of artistic fun creating murals. 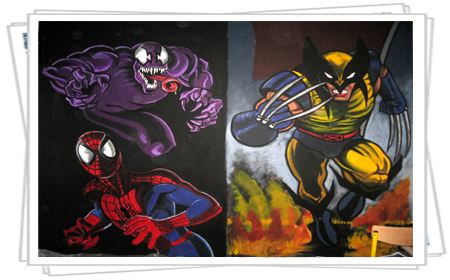 Greg had initially created a Simpsons mural at the school and was approached to get the kids involved over the summer. Wonderful work followed with the students chosen subject "Marvel Characters", and with steely determination they brightened up St Peters School for a long time to come, heroes wouldnt you say? 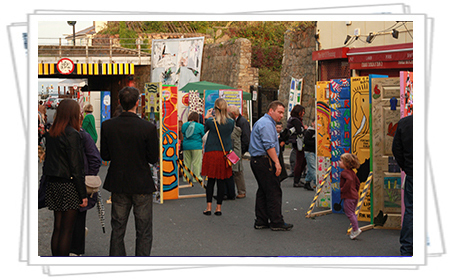 Signal has had a long association with Bray School Project; since Signal opened its doors we have been offering the services of our artists to this annual event. It is usually a very enjoyable event for both artists and children in the school. There is always a great variety of activities for the children to get actively involved with. 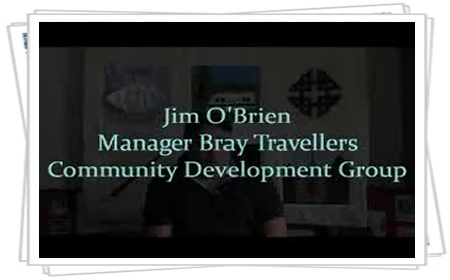 Signal Arts Documentary with Bray Travellers Community Development Group and friends. Signal Arts has always had a strong bond with the Bray Community, here we talk to Jim O'Brien, Greg Murray and Denis Dunne about Signals involvement within the Bray locality plus click on the image right to see some of the Bray Travellers members quilt work..
Signal Arts once more helps in the production of the Narnia Exhibition. Christ Church Bray has been transformed into the Land of Narnia for Lent. Here is a selection of images of the exhibition displaying the wonderful work and creativity of Aoife Fitzgerald and Tony Clarke who with other artists recreated the mythical creatures and backdrops from the C.S. 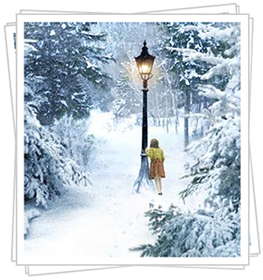 Lewis novel "Narnia". Here, through the exceptional photographic eye of Denis Dunne we capture various preparational stages of the works involved. Signal's involvement with Culture Night this year was a huge success, with over 500 people taking part! It seems each year we become stronger and stronger and from the turn out we can see it's also important for the community. 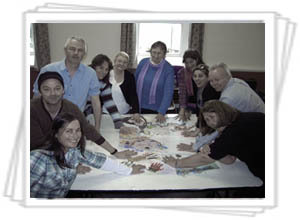 The event "Hands Across Bray" was an interactive community arts project. We were based in the old Central Garage on the Main Street and on Culture Night we invited the public in to continue with the castings which then became part of the installation pieces. 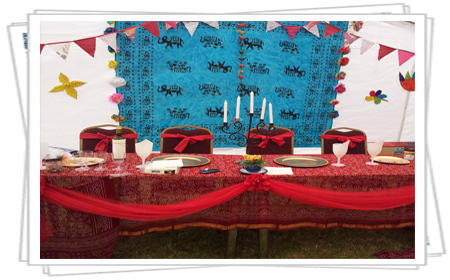 This event was so popular we had artists working round the clock to cater for the demand. Overall, a very rewarding experience and very much a community and family event. Signal artists have a strong connection with Festina Lente over the years. Here is a selection of images from one of the many events. the costume drama that was filmed last summer. Signal artists worked with Christ Church for the Remembrance Flower Festival, which took place from the 6th to the 13th of November with an official opening on Sunday the 6th of November. Michelle and Noel painted fields of poppies on a backdrop for the altar and panels at the sides of the church while Aoife painted some war and anti-war images. Frances created a ceramic panel depicting the horrors of war and Vincent put together a sound track, recreating the military sounds of the first and second world war and the feel of civilian life at that time throughsound and music. Denis, Sylvia and Noel were the co-ordinators of 2011's Culture Night; they created a pop-up artist collective called Croi 8 – a play on the word create – get it! Using their resourcefulness and creativity Croi 8 responded to a space in the centre of the town, the old St. Cronans (beside The Mermaid), on the theme of “culture is at the heart of a community”. The collective created an exciting exhibition incorporating traditional and multi-media disciplines. 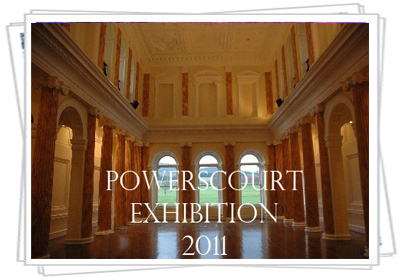 The exhibition was open to the public from Wednesday 21st September with a wine reception held on Friday, Culture Night. 11 of the Signal staff recently completed a train-the-trainer course with Gerard Fitzpatrick of Fusion Training and Development. The course improved our facilitation skills and at the same time built the Signal team spirit. It was a very enjoyable and hugely beneficial week for us all. Many thanks Ger for all the encouragement, support and fun! Signal Arts and the Carmona Group have been working together for many years now. Here we display some of the budding artists works done in Signal Art Classes at the centre. 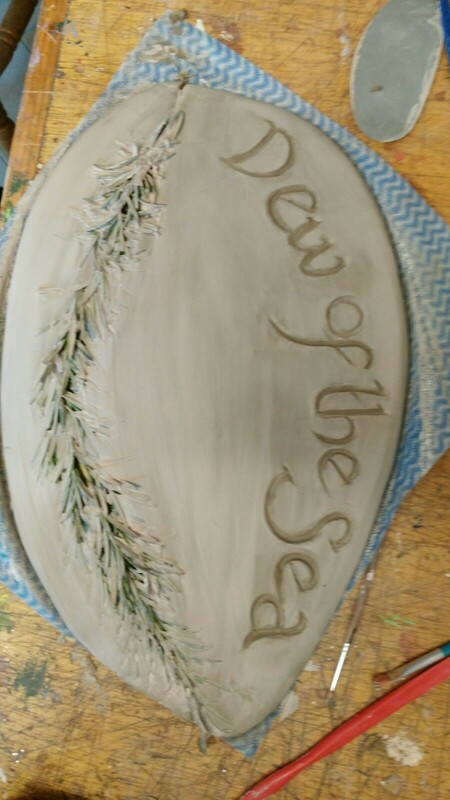 Signal artist, Frances Brosnan, designed and implemented this ceramic course for women who are currently on the Adult Access Programme in St. Fergal's Family Resource Centre in Bray. 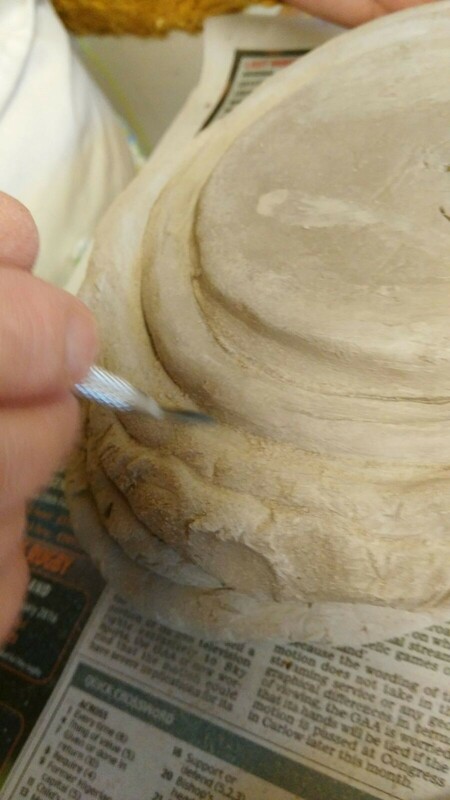 Five women currently participate in the course which covers hand-building techniques including pinch pots, coiling, slabbing. They have created tiles, wall plaques, pots, boxes, and jewellery. These pieces were then decorated with slips, glazes and sprigs and fired in the kiln. 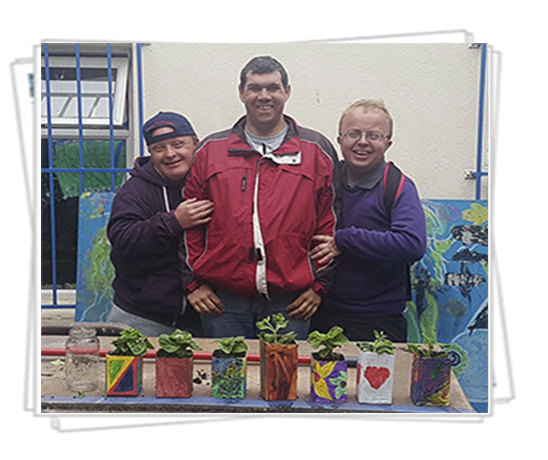 We collaborated with HR Youth Centre to design and create a garden in their space behind the Holy Redeemer Church in Bray. Some artists had a meeting with Dermot O'Brien to assess how we could be of benefit to each other. We were all very impressed with the space and the ethos of the group. 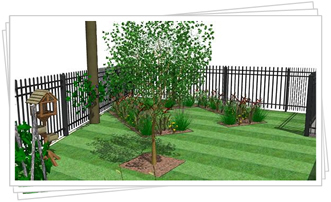 Andrea Lowe, our resident garden designer, was the perfect match for the project. Since then Andrea has met with Dermot and they decided on the approach to the project. The take up from the teenagers has been very encouraging and we are very excited to see how this project has developed. You are welcome to join this informal gathering of working artists, meeting to discuss art and art related matters from its philosophy to its creation, from its practice to periods of fallowness. This is a space where working artists can feel free to brainstorm, analyze, construct and deconstruct the visual arts. Different opinions create discussions which are lively, engaging and facilitate the development of ideas. The conversation is often about directions that artists can both start from and arrive at. The sessions are not always topic based but follow the interests of those present on the night. Three Signal Arts Centre staff artists are currently facilitating projects in collaboration with Springboard Family Support Project. The aims of this project are to develop the skills of the boys in order to produce images for spray painting. Through the process of research and development the boys will produce a series of images, these images will then be used as templates for the spray painted project. The process should encourage the creative process in order to enable production and design. It should boost self esteem in the boys and encourage self belief and a sense of achievement. This class takes place once a week in Springboard on Wednesday 3pm - 4.30pm. The aim of this class is to create art & craft skills to engender and develop an understanding of abilities and skills that the children have not acknowledged. 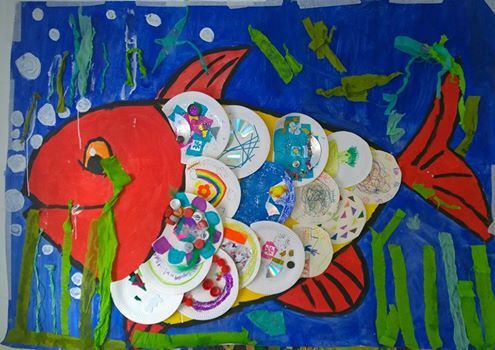 Through the process of art making the children will develop skills and awareness around themselves and their abilities. The will learn how to create and will also learn how to work in groups. The children will come to see themselves as capable and worthwhile. This class takes place once a week in Springboard on Tuesday 3pm - 4.30pm. The aim of this group is to develop a fun, interesting class while introducing them to a range of photography projects and techniques. Through the process the group will learn the skills to produce simple creative ides, using their own images and creative skills. Christine hopes to expand their knowledge of digital phography and digital editing skills using programmes such as Picasa and Photoshop. The aim of this group is to work with both mothers and children to create a project that can be enjoyed by both. The process will be to engage the mothers in taking photographic images of their children and to use these in lots of interesting ways. This will create a bond between mother and child and also develop their skills in Photoshop and creating images. This is a project that was instigated by two of our staff artists, June and Róisín, as part of our outreach projects. Both artists were keen to instigate this project as they felt that the elderly, especially those in nursing homes can be an overlooked part of our society. 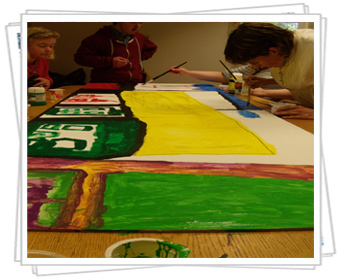 The project allows the individuals to come and do some painting and drawing or simply sit and be part of the group until they feel comfortable enough to join in or not. 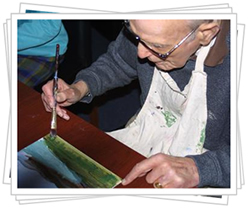 Some of the participants would not have painted for many years and it is a joy to see them rediscover their creativity. 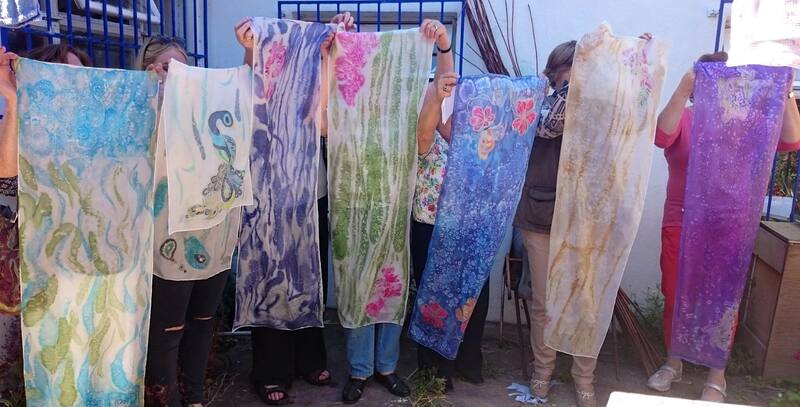 This is a collaborative project and the artists/facilitators gain as much from the process as the participants. This is a project that was instigated by two of our staff artists, June and Róisín, as part of our outreach projects. It is currently being facilitated by Joanne and Sarah. These classes take place once a week in the nursing home. Signal artists Greg Murray and Denis Dunne were selected for the Artist in the Community Award 2008. Their project brought together two groups from the community - young and old - in a collaboration that facilitated the social interaction between them through dialogue and stories. The idea was to record some of the stories of the past and to produce a visual representation of each recorded story. Because of the changing family structure they felt that uniting the two generations was a valuable way of readdressing the imbalance. The local Church of Ireland Rector got in touch with Signal in 2008 with a very elaborate plan to transform the Church into several scenes from The Lion, the Witch and the Wardrobe for the two week period of Easter 2009. We had several meetings with them to firm up the ideas and input our creativity and functionality of the plans. It was a very exciting project and some of the artists here at Signal embraced the project with great enthusiasms and professionalism. 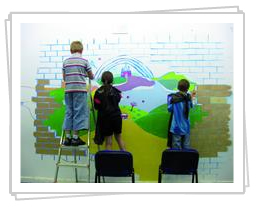 Aoife and Róisín were responsible for painting backdrops etc. in some of the 14 scenes required to fill the church. 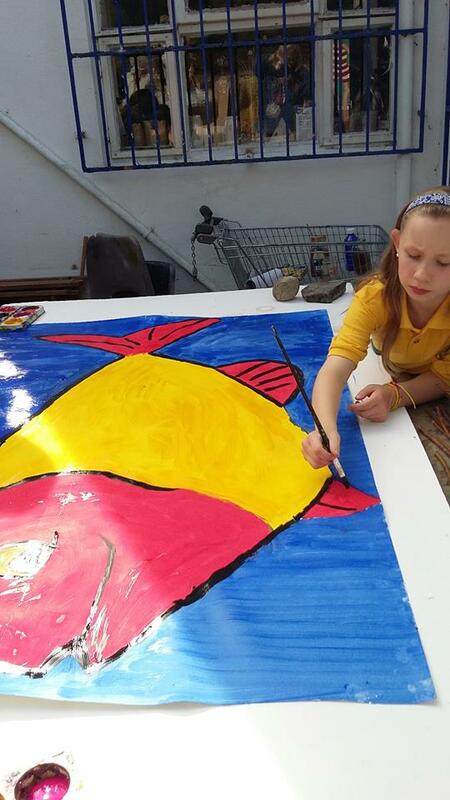 Lian painted an image of Aslan that was displayed on a St. Patrick's Day float to advertise the event. Vincent and Ilan were responsible for the many sound elements of the display. The event was held in Christ Church Bray from 29th March to 12th April 2009. All money raised from the running of the event was donated to charity. Watch a short video of the Narnia project or view some photos of the event here. Signal run an Art and Crafts class two days a week with Rehab Care. Participants explore varied mediums creating their own artwork in a relaxed and fun environment under the supervision of trained artist facilitators. These classes allow for creative productivity that allow each individual participant to develop and enjoy their own creative skills. Signal ran Art and Crafts classes with Festina Lente at the Signal Arts Centre on Thursday Mornings. They also ran a ceramics class facilitation on a one to one basis. Participants explored varied mediums creating their own artwork in a relaxed and fun environment under the supervision of trained artist facilitators. These classes allowed for creative productivity that encouraged each individual participant to develop and enjoy their own creative skills. Read more about Festina Lente here. 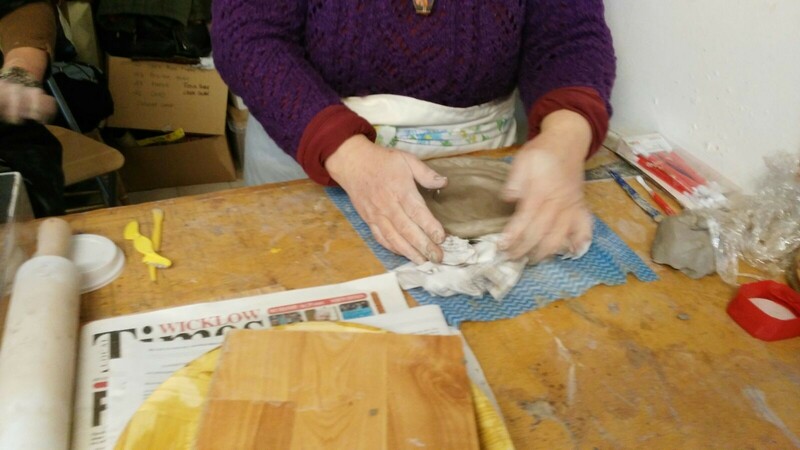 Signal Artist Maura Ryan facilitated this ceramics course which was held for women who were involved with W.E.B., Women's Equality Bray. This was a group for local women aged over 45. The course was for 8 people at a time. The pottery course started with hand building with clay. 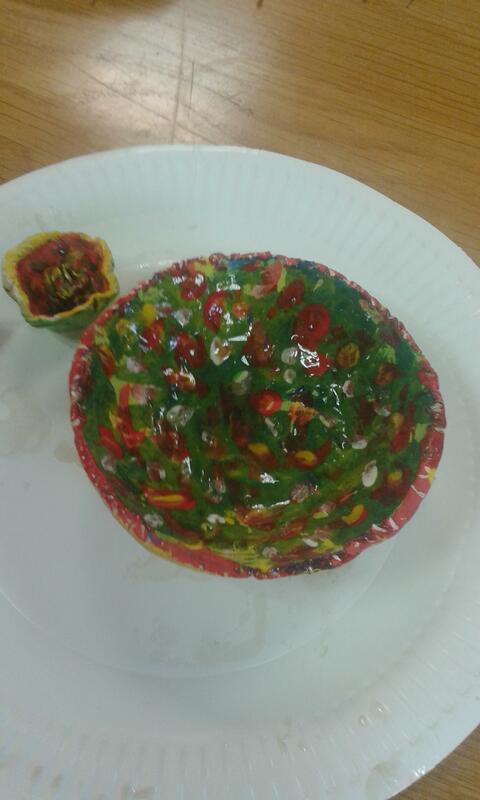 Other activities included mask making, moulds, glazing, working with coloured glass and firing. This project was facilitated by two artists, the premise was to create a galaxy using balloons. 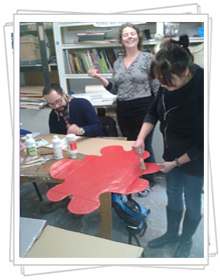 The ideas were structured in consultation with the group and some of the media included papier maché and painting. 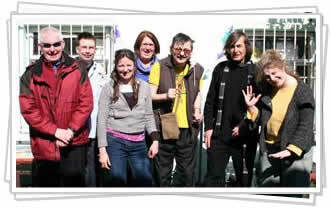 Here at Signal we have developed relationships with many local groups and organisations. 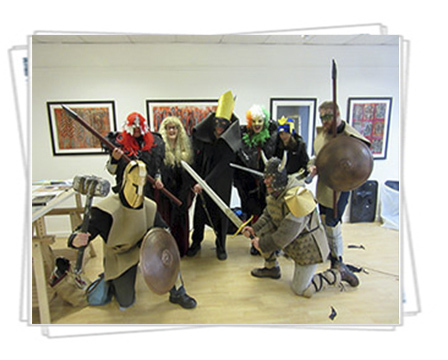 Signal artists provide activities annually at the Ravenswell Easter and Summer Camps. A most enjoyable project that involves working with children who are always eager to contribute creatively with lots of energy. We are always delighted to be asked to provide art activities for these Camps. The job involves providing activities that are accessible to all age groups and abilities. 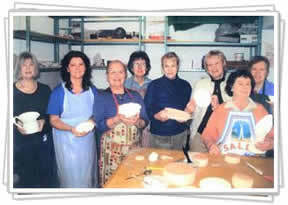 This is a group of women artists that have been using the Signal Art Centre for fifteen years. 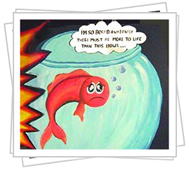 They avail of tutoring and produce artwork through many different mediums. Eileen O' Donnell is the contact person for the group. It originally started in 1994 under the guidance of Tom Joyce and was then continued by Miriam Sweeny. 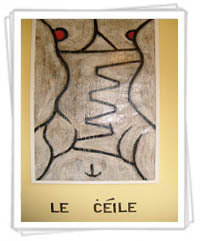 They had their first exhibition with Syliva Hill in 1996. Róisín Verdon is the the current facilitator of this group. Over the years, they have covered a wide range of mediums i.e. 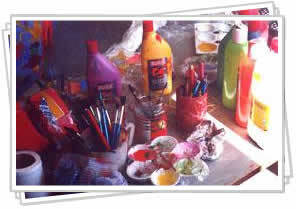 oils, water colours, acrylics, charcoal, conte, pastels and batik, but the preferred medium is oils. They have covered a wide range of subjects ranging from sketching, still life, landscape, portraits, printing batik, collage and framing. 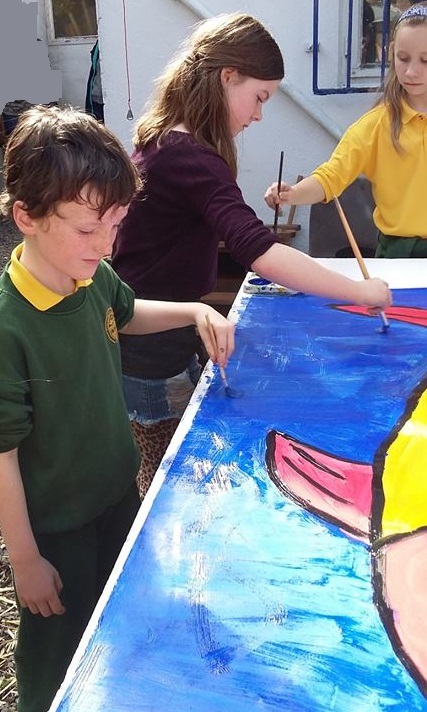 In collaboration with Little Bray's School Completion Officer two artists from the Centre worked with a group of children in the school to create a mural. 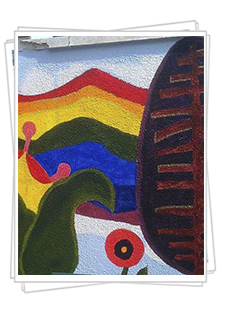 Using mixed media such as painting, mosaic and ceramics, the mural depicts the cultural history of the travelling community as told by the children. A staff artist worked with a group of teenagers to come up with a concept and a script for a cartoon and then to design and transfer the design to the wall as a mural. Another artist is working with the same group to design and implement a plan to customise the furniture in the Youth Centre using mosaic and painting. 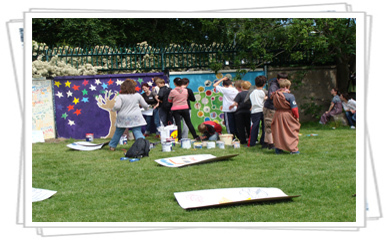 An idea using the local environs was put forward by sixth class to create a mural. The children took photographs of their local area that had significance for them and between the artist and the class they designed a mural and assisted in the painting of same. Signal have been working with various groups from DunLaoghaire Youth Services for a number of years. Projects include Art Weeks, Murals, Festival production, graffitti workshops, photography, ceramics, art tutoring and inhouse workshops. Artists Greg Murray, Jan De Groot and Deirdre Maher-Ridgeway are currently working on projects with Shankill, DunLaoghaire Central and Mountown Youth groups. Through interaction with DLYS Signal Artists have been making links with other community based organisations in the area. Their participation with youth and community groups is onging and expanding. Signal artists Jim Morrison, Yanny Peters, Noel Cleary, Cathy Doyle, Eleanor Philips have also worked on projects for The Celtic Ghost Festival, Mountown Boxing Club and Loughlinstown Community Centre. This project was motivated by the lack of use of the community hall connected to Giltspur Estate. 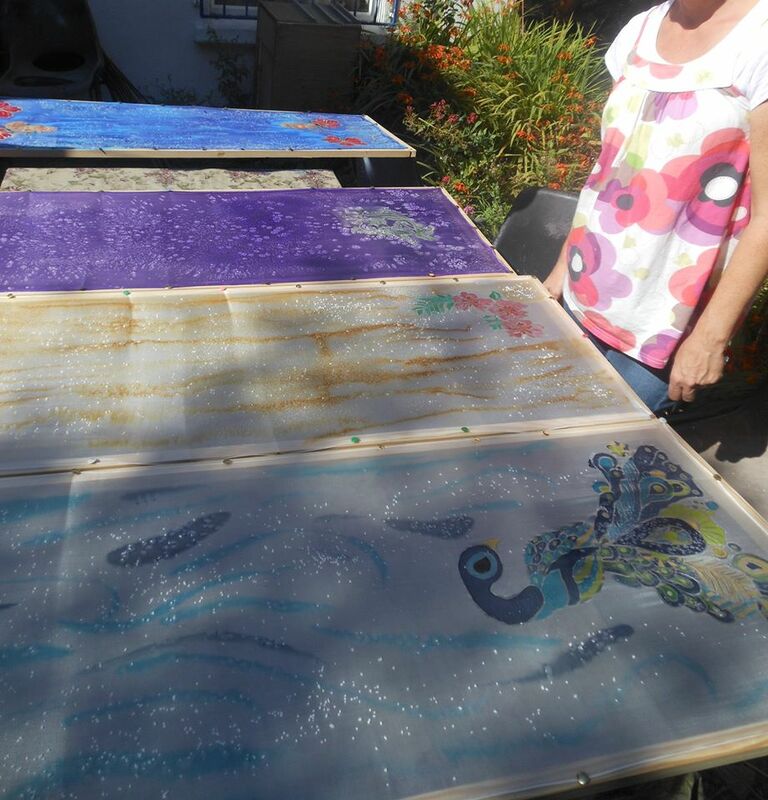 Two artists from signal, Katie Dutton and Liz Tierney, initially started art classes - mosaic - for the children of the estate. 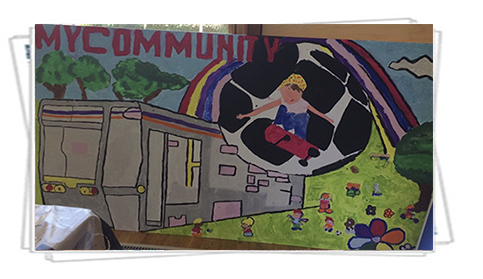 Motivated by the huge interest from the children, the staff artists proceeded to nurture a sense of ownership of the community centre by creating a mural designed by and implemented by the children. 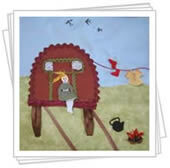 Signal artists have worked on various projects with the Bray Womens Traveller Group. The most recent being in 2006 when one of the staff artists, Pam Scally, worked with the group to create a quilt that celebrated the lives of traveller people. The quilt was on display at the end of year with other projects the group had worked on. In 2007 Jenny Smith, The Seomra Youth Centre co-ordinator, got in touch with Signal to ascertain how we could be of assistance to eachother. After a few discussions with all concerned, Signal, Jenny and Youth Group, it was decided that they would like a mural designed by the group. Sonia Haccius was the artist from Signal who facilitated the group. The result was spectacular and we hope to collaborate with this group again on other projects. 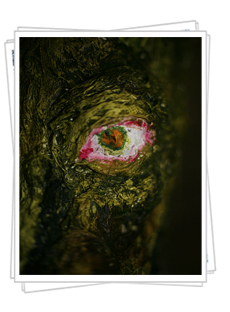 This is an annual collaborative project funded by Wicklow Arts Office and administered by Signal. Julie Merriman was the artist chosen by Signal and Bray Youthreach was the community group chosen. Using nature to encourage the group to explore different methods of drawing, Julie then got them to print their drawing. The work was exhibited in the centre and was very well received.